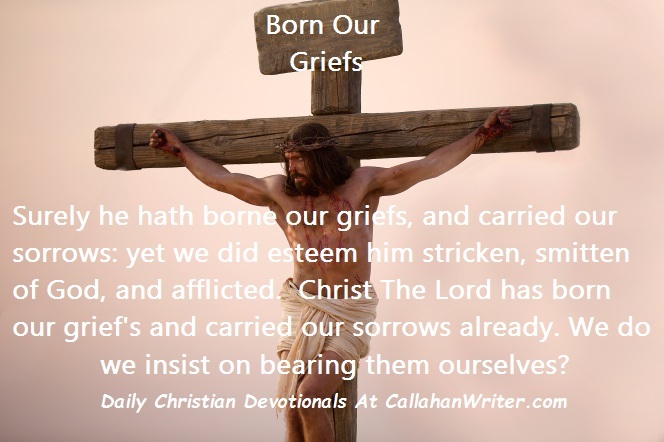 Daily Christian Devotional – Surely He Hath Born Our Grief’s | Troy C. Wagstaff aka CallahanWriter Blog: Topics of interest include Western Historical (1865-1899) Topics. Additionally inspirational Christian and Fibromyalgia interests. This daily Christian devotional focuses on the benefits of the atonement of Jesus Christ. Jesus suffered for our sins and the sins of the whole world in the garden of Gethsemane and again on the cross of Calvary. His dying brought new life for us when he was resurrected. He suffered for both our sins and for our sorrows. When we sin, we have sorrow. But we have sorrow for many other reasons. We don’t have to live in the depths of despair when we sin. We can ask our Heavenly Father for forgiveness of our sins and know that we will be forgiven. We can also let our wounded soul be restored whole and well again by letting the Saviors’ atonement heal our sorrows. We do not need to carry the weight of sin and sorrow if we let the Lord into our life. Whether you choose to repent or not, whether you choose to let the Saviors’ atonement help you or not is up to you. It was done some two thousand years ago. It is a done deal that history bears a witness of. Whether you choose to let it into your life or not, doesn’t change the fact that it happened. So take hold of the eternal and endless sacrifice and let it into your heart and soul and be healed. Why try to bear the weight of our sins and sorrows on our own when we don’t have to?